Last week, I received a package from House of Formen! Now as cool as it would be to be like "hey, this company sent me a PR package! Don't worry, this is not sponsored", that's not the case but let's pretend it is (I used to intern for Formen so this was my goodbye gift). Makeup is for everyone, guys and girls, but only recently have guys been told it's okay for them to use makeup products. But for the guys who want to try it out, they don't really know where to start. That's where Formen comes in. House of Formen is the world's first cosmetic house that targets men's specific skin needs by providing specific makeup and skin care solutions to common problems. I should know. I wrote the sell copy. But I genuinely think the company is filling a need in the market. Most guys don't know what to do in terms of skincare, much less makeup, so Formen is giving them the most basic tools to get started. In terms of skincare, Formen just launched a new skincare system on Kickstarter (one of the projects I worked on) so go check it out (http://kck.st/2lHJLHo)! Here, we have the Brightening CC Cream in Light (we'll see how this goes. According to Cover FX, I'm "medium-dark". Let me know). The company also sent over both of their pro palettes, one for colour correcting and one for concealing, and the Invisible Blotting Powder. You can buy each of these products individually or all together as part of their "Kit". Now, onto the review. This pressed powder is so silky and smooth when applied to bare skin! Unlike other transparent powders, this doesn't leave a white cast and a little goes a long way. It instantly mattifies oily skin and is great for anyone who doesn't want to add any pigmented makeup products to the face. The pressed powder compact comes with a mirror so it's great for on the go. The applicator it comes with is super soft and smooth but it's quite flimsy. Other than that, it's a good, basic product that anyone with oily skin will appreciate. House of Formen has two pro palettes: the Correct and Conceal Palette ($27.99), and the Concealer Trio ($29.99). The Correct and Conceal Pro Palette is a colour correcting palette with purple to cancel out sallowness, green to cancel out redness, and orange to cancel out darkness, like dark circles or dark spots. The Concealer Trio features three concealer shades: light, medium, and medium-deep. This way you can custom mix a shade for your perfect match. While swatching the shades, I noticed that the formulas were super creamy and easy to blend which will result in a more natural finish. However, if your skin does not match one of the three shades exactly, mixing can take some time which makes it a little difficult for everyday use, especially if you are in a hurry. This CC Cream might be my new holy grail! This CC Cream claims to moisturize, mattify, even out skin tone, brighten, prime, and protect with SPF 20. Previous BB and CC Creams I have used have been very medium to full coverage formulas. For me, I want a CC Cream with very light to medium coverage for a very natural, everyday look. Formen's CC Cream has a very light, sheer coverage which is just enough to even out the skin tone without actually concealing anything. It's your skin but better. 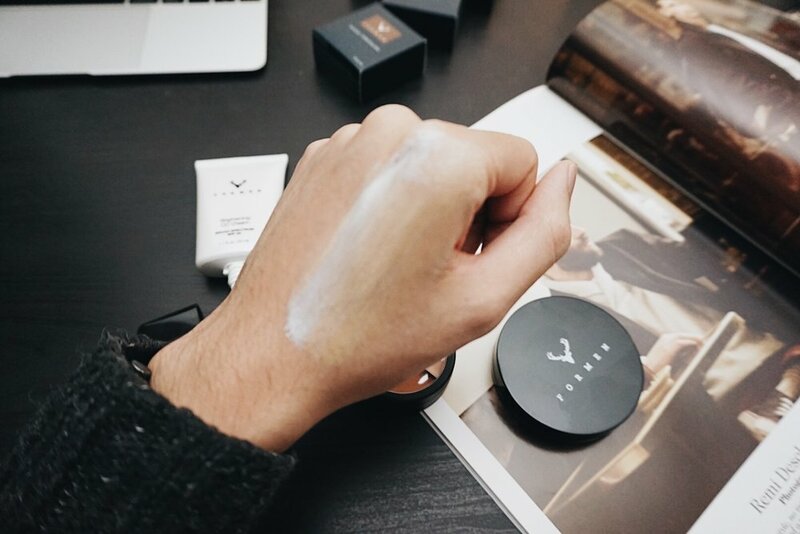 The product itself is white and changes colour as you blend it into the skin. The concept is very similar to the Body Shop's original BB Cream, however, this formula mattifies once it sets. It might feel a bit tacky on the skin because it is moisturizing, but after about 5 minutes, I could tell that it had a demi-matte finish that was soft and smooth to the touch.